This annual golf tournament, hosted by the CAFNR Alumni Association, is a four-person scramble, 18-hole shotgun start, benefiting student scholarships in the College of Agriculture, Food and Natural Resources. Anyone is invited to register and attend. Registration 10:30 a.m. • Lunch 11 a.m. • Tee Time 12 p.m. • Reception 5 p.m. • Steak Fry 6 p.m.
Players will be teamed up if they have less than 4 players. Teams which do not have a foursome are invited to sponsor a student golfer. 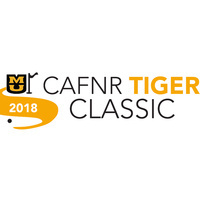 CAFNR Tiger Ag Classic participants receive a ticket to the Great MU Steak Fry, which follows the tournament, with their registration fee.